This rich and buttery classic Spritz cookies recipe is easy to make with a few simple ingredients. They are crispy and tender and great as a homemade gift. I have grown up eating these classic Spritz cookies my entire life… they are so rich and BUTTERY! It was such a DISASTER! The dough was sticking to everything and I made a huge mess. However, after a lot of practice, I can probably make these cookies in my sleep now…lol. These TRADITIONAL Spritz cookies are great as a homemade gift and easy to mail as well. 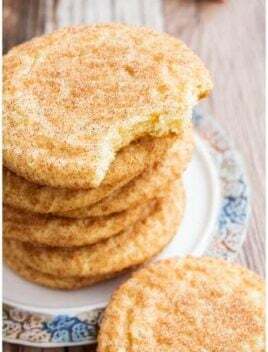 They are made with a few SIMPLE ingredients that I bet you already have your pantry: Flour, Butter, Sugar, Eggs, Baking powder and Extracts. 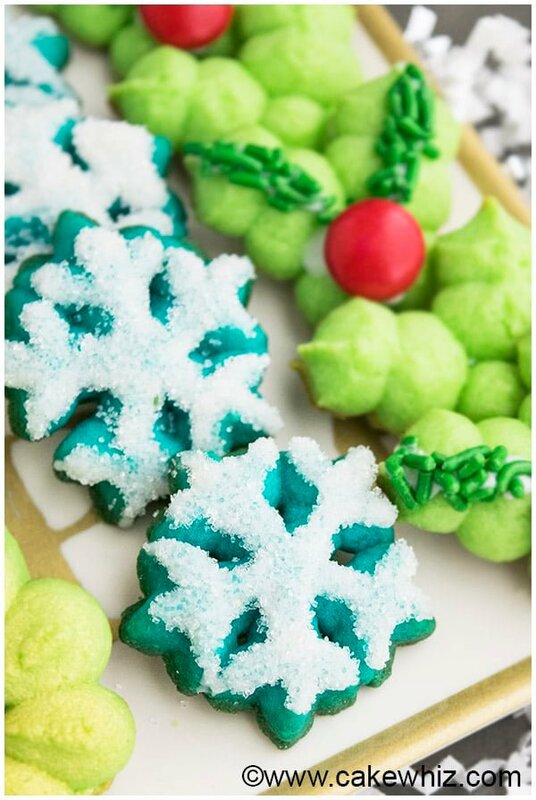 In a couple of weeks, I will be preparing boxes of Christmas cookies for my family and it will include these mistletoe cookies. 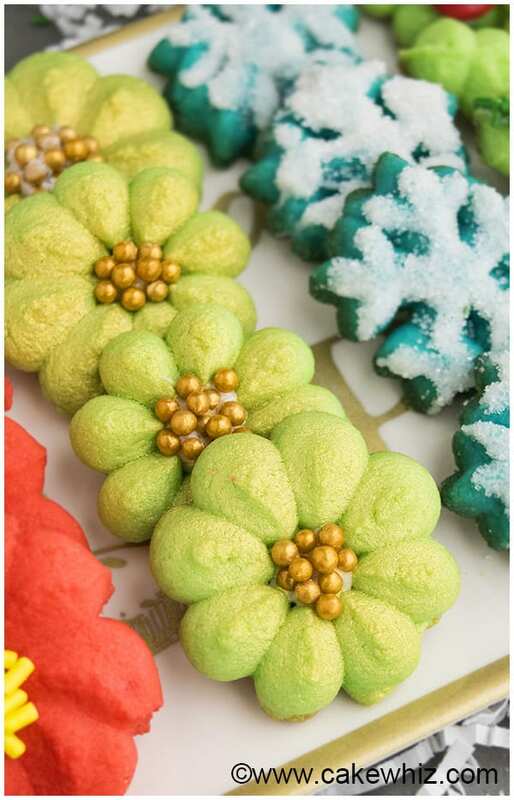 I will also add these these whimsical SHINY greenish gold flower cookies. Plus, there will be some SPARKLY snowflake cookies because they are perfect for a snowy Christmas party. The FUN won’t end there. 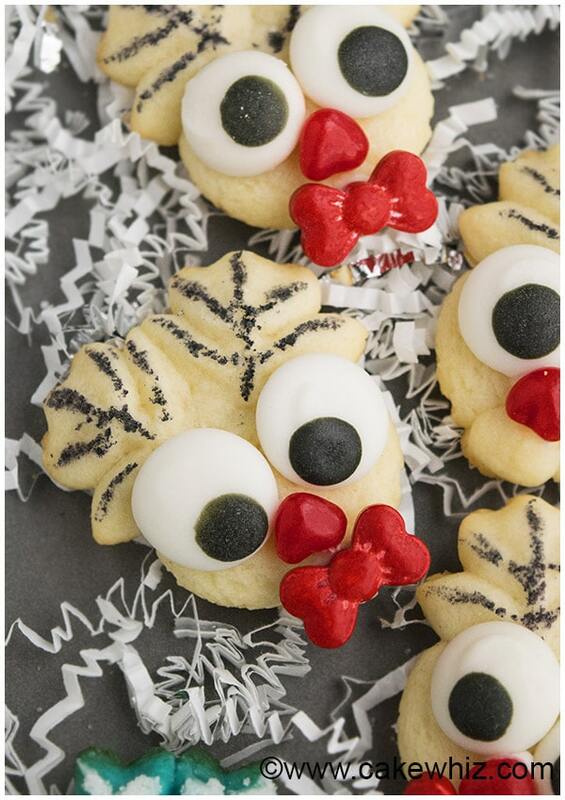 I will be making these ADORABLE Rudolph cookies for the kids boxes. Just look at their fancy little bow ties! hehe. 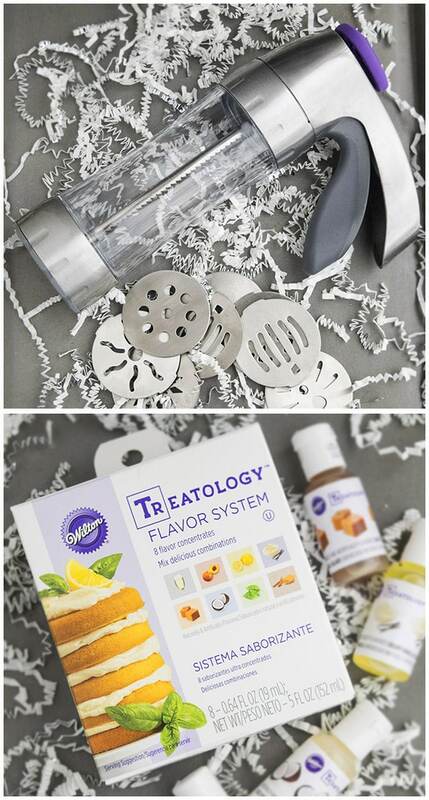 ALL of those easy Spritz cookies are made with a cookie press…It’s super fast! This handy picture will let you know what cookie press discs you need to use to make the relevant cookie designs. I know some people have a very HARD time with making Spritz cookies. 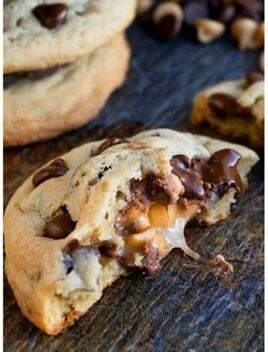 Today’s post will be the ULTIMATE guide for making these cookies, including the tools you need and ALL the tips and tricks I have picked up over the years. First of all, I highly recommend Wilton’s Preferred Press Cookie Press. It comes with 12 discs that have wonderful designs, suitable for many occasions. You can also get additional Christmas discs like this Fit Right Holiday Cookie Disc Set. This cookie press is reasonably priced, easy to use and easy to clean. It has a FIRM grip and doesn’t slip or move around while you are extruding the dough on the cookie tray (Thank God!). This year, I also used Wilton’s Treatology Flavor System today to add flavoring to these cookies. There were 8 AMAZING flavors in the box: Crisp Champagne, Sweet Meyer Lemon, Fresh Basil, Warm Cinnamon Graham, Juicy Peach, Salted Caramel, Creamy Vanilla Custard and Toasted Coconut. I am currently OBSESSED with the toasted coconut and salted caramel flavors. Make sure your butter and egg is at room temperature. If the dough is sticking to your press, chill it for 20 minutes and try again. Divide the cookie dough into smaller portions and roll them into long cylinders. This makes it easier to put the dough inside the cookie press. To prevent the cookie edges from becoming brown and ugly, make sure your oven is calibrated so that you bake at the correct temperature for 6 minutes only or until the edges are firm. Do not over-bake! Do not remove the cookies from the tray until they have fully cooled down or else they will break. Decorate the cookies, once they have completely cooled down. You can color the dough with gel coloring. Do not use liquid food coloring since that will make the dough sticky. You can flavor this dough with any extract of your choice. Cookie dough can be frozen in sealed freezer bags for up to 1 month. I am not too fond of freezing baked cookies. 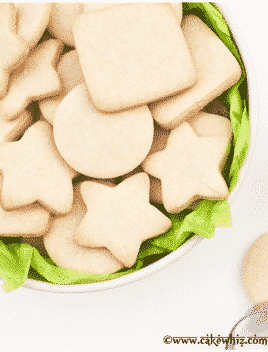 Store leftover cookies in an airtight container at room temperature for up to 1 week. What are Spritz cookies? What is their history? Where did they originate? 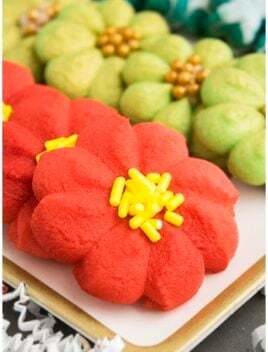 Spritz cookies, also known as butter cookies or press cookies are a very popular traditional Christmas cookie. Based on my readings, they appear to have originated in Germany, around the 16th century. Wow! What is Spritz cookie dough? The process for making this dough is very simple. You cream butter and sugar together until light and fluffy. The, you mix in eggs and extracts. Finally, you mix in flour and baking powder and knead into a dough ball and use it in a cookie press. How to make Spritz cookies? You use a cookie press. Basically, put the dough in the barrel of cookie press gun. Then, you place it on top of a cookie tray and press the trigger until dough squirts/extrudes out through a patterned disc, yielding pretty cookie designs. Then, you bake and decorate the cookies. What do Spritz cookies taste like? Are they soft? They are rich, buttery with a fragrant vanilla flavor. No, they are not soft. They are crispy, tender and fragile. 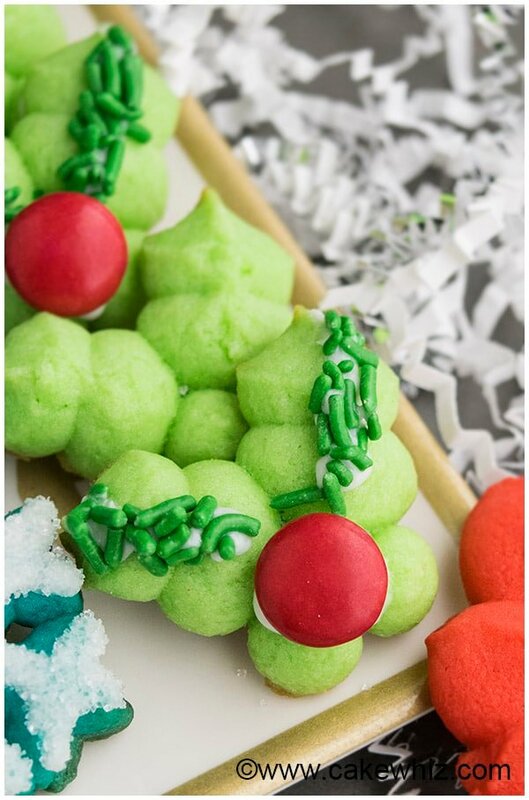 When to decorate Spritz cookies? 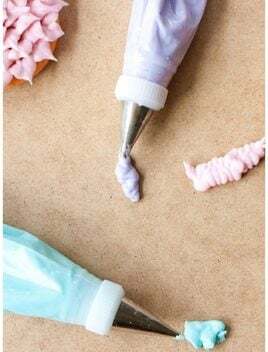 You can decorate them before baking by tossing sprinkles or sanding sugar on each piece OR after baking through a variety of options, discussed below. 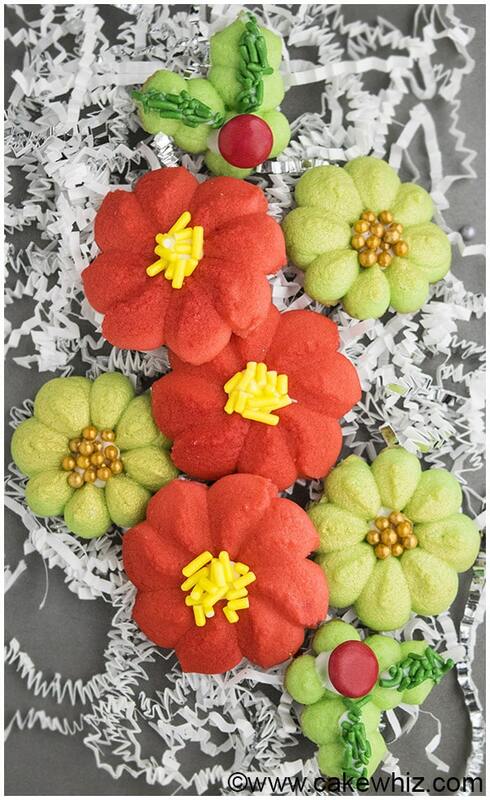 How to decorate Spritz cookies? How long do Spritz cookies stay fresh? How to store them? Store them in an airtight container at room temperature for up to 1 week. How to make Spritz cookies without press? You can pipe the cookie dough. Basically, attach a big tip such as TIP # 1M to a piping bag and fill it with cookie dough. The, pipe designs on a cookie tray and then bake. You will not get many cookie designs this way though. Why are my Spritz cookies flat? Why do they spread? 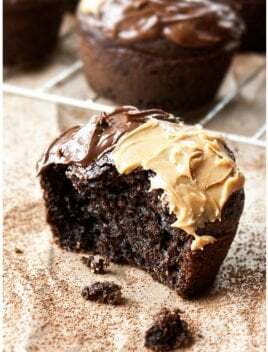 You did not use enough baking powder. Your cookie dough is too soft. Chill the dough for 20 minutes and then use it in the cookie press. It’s too hot in your kitchen, making your dough very soft. Chilling for 20-30 minutes will help. How to freeze Spritz cookies? You can freeze this cookie dough in sealed freezer bags for up to 1 month perfectly. You can also freeze baked cookies in sealed freezer bags for up to 1 month but in my opinion, they don’t taste very fresh. Why are Spritz cookies sticking to press? That’s probably because the dough is too soft and sticky. Chill the dough in the fridge for 20-30 minutes and then try again. How to get Spritz cookies to stick to pan? Do not line your cookie tray with parchment paper or wax paper. Do no grease your pans. This dough DOES NOT stick to those surfaces. Just use a good quality cookie tray and squeeze dough on it. Then, mix in egg, mill and vanilla. Dump the dry mixture into the wet mixture and mix until it becomes lumpy. Then, use your hands to knead the dough into a ball. Separate the dough into 3 or 4 portions and use gel colorings to color them. Attach a disc of your choice to the cookie press. Fill the barrel with dough. Press cookies onto a cookie tray that is NOT greased and that is NOT lined with parchment paper. 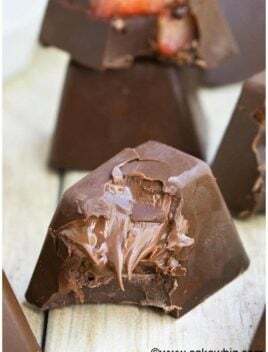 Bake at 350 degrees for 6-8 minutes or until the edges are firm but not brown. 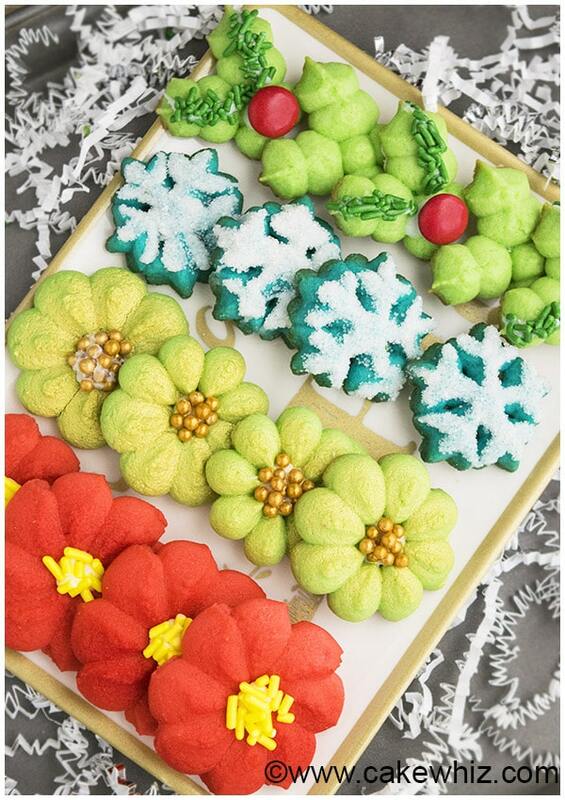 Allow the cookies to cool down completely and then decorate them, any way you like. Enjoy! Store leftovers in an airtight container at room temperature for up to 1 week. These cookies turned out so pretty! I love using cookie presses! 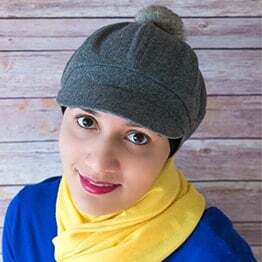 Thank you for the video, I bought a press last year, I’ve been afraid to try to make any….but with your video, it calmed my fear of failure! Where do you buy the gold edible spray, that just brought the cookie up a level higher, in the look department, they were already beautiful, but wow!!! 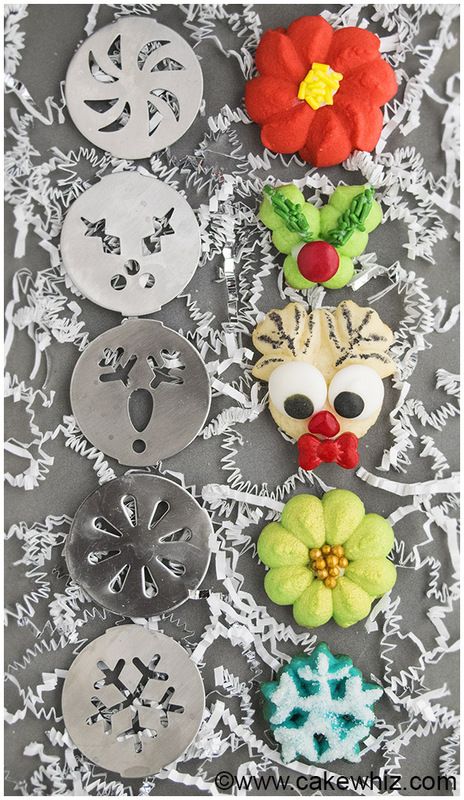 Once you start using that cookie press, you are going to love it. You can get the spray on Amazon on Hobby Lobby or Michaels. It’s fairly cheap and less than 5 bucks and there are so many colors too. I think it makes the cookies very salty. I would not recommend it. You can half salted and half unsalted, if you like the sweet and salty flavor.